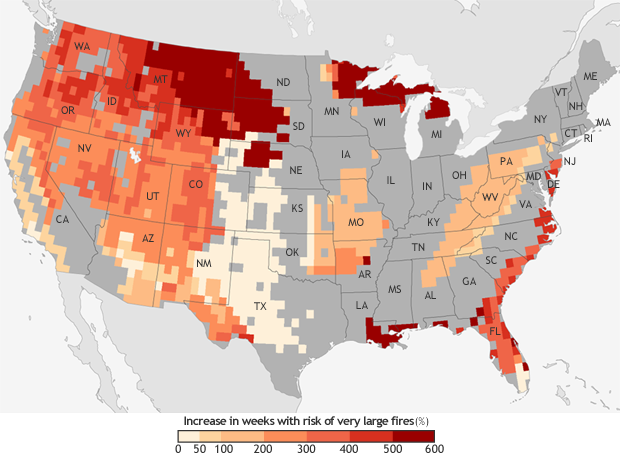 Earth Matters - 6 Trends to Know about Fire Season in the Western U.S.
6 Trends to Know about Fire Season in the Western U.S. This entry was posted on Thursday, November 29th, 2018 at 5:53 pm and is filed under Climate, Natural Hazards. You can follow any responses to this entry through the RSS 2.0 feed. You can skip to the end and leave a response. Pinging is currently not allowed. Has the Dept of the Interior been informed of these alarming facts and conclusions? If so, is there any attempt to develop a long range strategy to cope this imminent threat? Fascinating work. I’m curious as to how the spatial and temporal elements of this work might correlate to population density and indirectly, the amount of electric power lines that have been installed in the urban/wildland interface areas throughout the Western US. 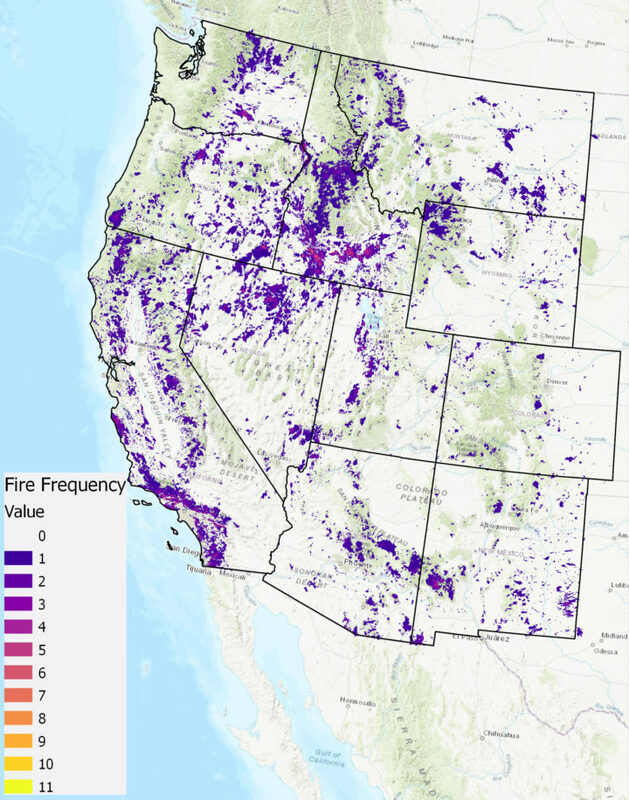 Also, I would be curious to know if there is any relationship between forest land management practices on public lands in the West (as has been speculated in the media) and the occurrence of mega-fires in the West during this same period? 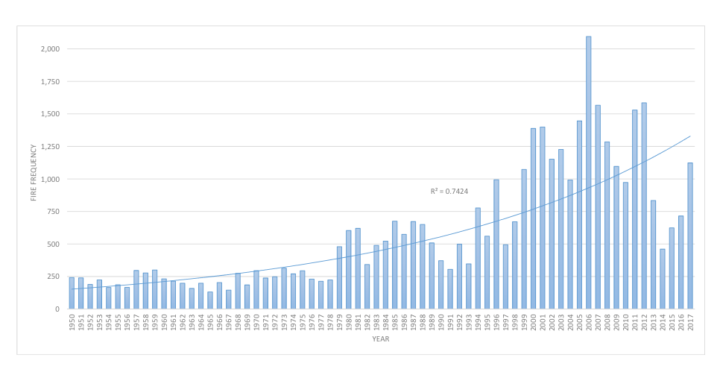 Nice study pulling together data from lots of sources and then documenting the changing Trend in fire activity. Thank you, NASA, for putting this out to the public. 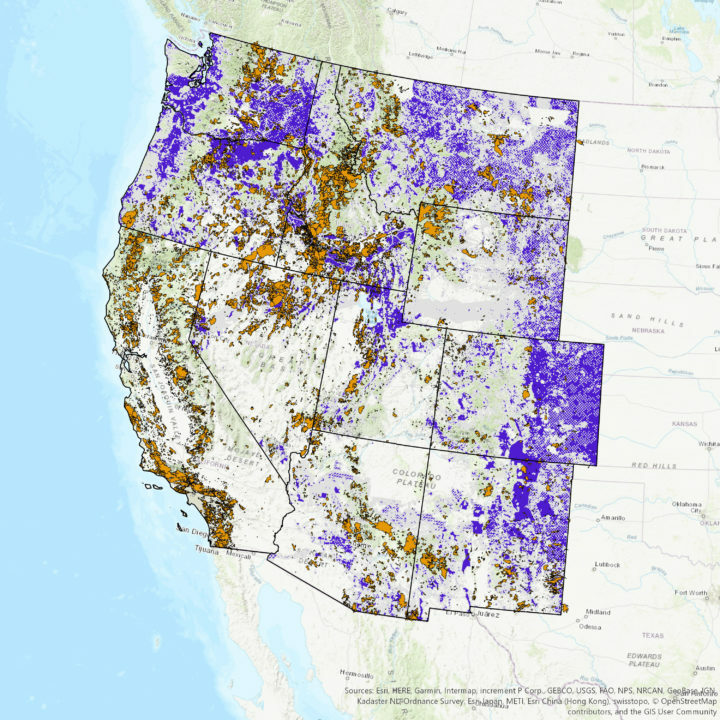 One question – in the map under Point number 3, there seems to be no differentiation between BLM and private lands, both show as “clear.” Am I reading this map correctly? Hi. Excellent analysis and publication. In section 4, I didn’t understood this: “About 3 percent—almost a third of the land—”. Is that correct? 3% of the 11% mentioned, which is almost 1/3. Does the data analysis program assume climate change as the only possible control, as this article seems to suggest? Usually scientists develop multiple working hypotheses and test among them for validity. Are there other possible reasons for increased fires, such as changes in forest management practices over recent decades? Or increased intersection of areas with electrical installations (which seem to start many fires) with susceptible forests? You could test e.g. for a temperature control by looking for a spike in fires in the 1930’s, when temperatures were also high. Would like to know what a more rigorous analysis would conclude. I am a retired wildland firefighter. 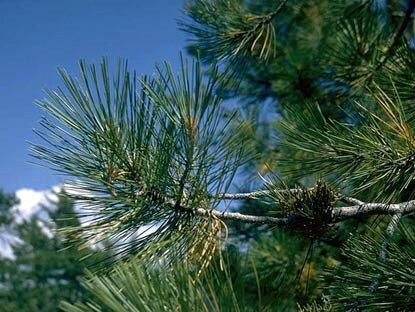 Other factors that should be noted include the spread of invasive plant species in range areas..ie. Bromus Techtorum. The change in fire frequency at higher elevations and latitudes. The occurrence of wind events and dryness in certain areas. Human population dynamics as they relate to the Wildland Urban Interface. Cultural attitudes and understanding of fire in fire prone areas. I did not see any reference to human population or habitation. I suspect that increases in human population and their choices of living locations has significantly affected the number of fire starts. Why did the NASA choose 1950 as the starting point for the charts of fire frequency and size? 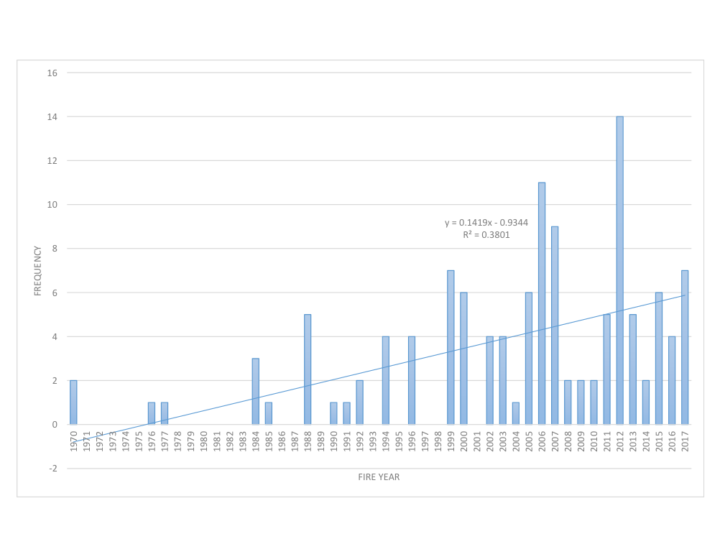 If they had chosen 1900, the charts would have looked very different: fire frequency and size were highly variable in the early 1900s and probably before, with many years far surpassing current fire frequency and size maximums. The “lull” between the 1930s and 2000 indicate that fire-suppression was very successful, and perhaps that we were in a relatively wet, mild period. I enjoyed reviewing this comprehensive analysis which will help understand the environmental factors that influence the incidence, severity, and damage from the wildfires during the last few years. The most recent devastating wildfires in California, the Camp Fire and the Woolsey Fire, affected entirely different types of terrain and vegetation. Was the pattern of these fires consistent with other California wildfires in the last 10 years? There have been and are attempts within some former wildfire zones to restore native plant vegetation. Are there studies which can assess the impact of these ecologically restored areas?